Nursing Central is the complete mobile solution for nursing. Look up detailed information written by and for nurses on diseases, tests, and procedures. Consult the comprehensive database of 4,600 drugs or refer to more than 56,000 dictionary terms whenever you have a question. 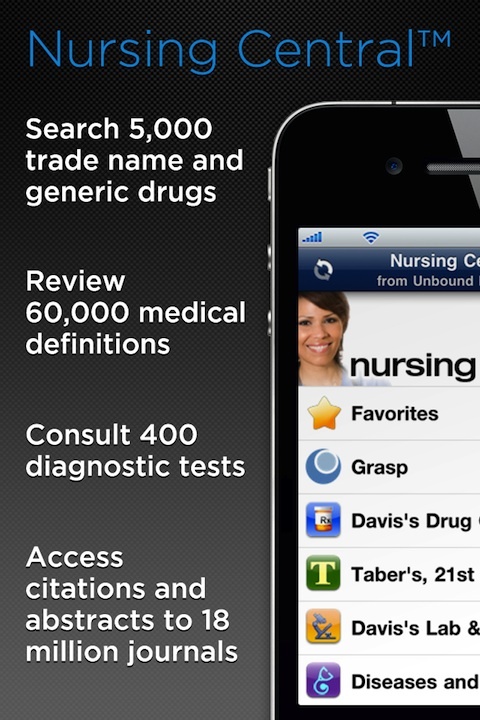 Search Medline or keep up with your favorite nursing journals by having tables of contents delivered directly to your iPhone. Note: This app requires a subscription which costs $159.95 annually. For more information visit the Unbound Medicine website. AppSafari review of Nursing Central was written by Joe Seifi on February 21st, 2008 and categorized under App Store, Education, Enterprise, Reference. Page viewed 7161 times, 1 so far today. Need help on using these apps? Please read the Help Page. just registered so i could try the free trial of your nursing central product on my new iphone 3g, but don’t see an option for that platform. The apple ox version won’t download with safari. Please advise. Thanks. Salut chers lecteurs quel est votre avis de mon nouveau blog sur l’immobilier?